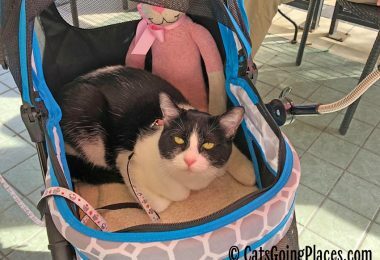 After our friends at Sweet Purrfections reviewed the Sherpa Comfort Ride pet carrier, they offered it to Cupcake for our trip to Kansas City. 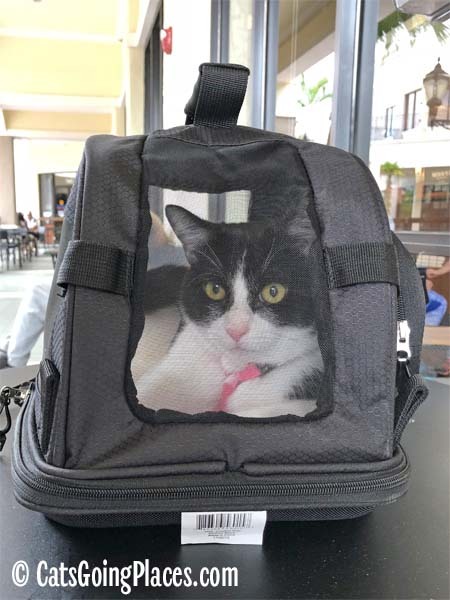 Cupcake didn’t get the chance to use the carrier for that trip, but she did get to spend some quality time with it since then. 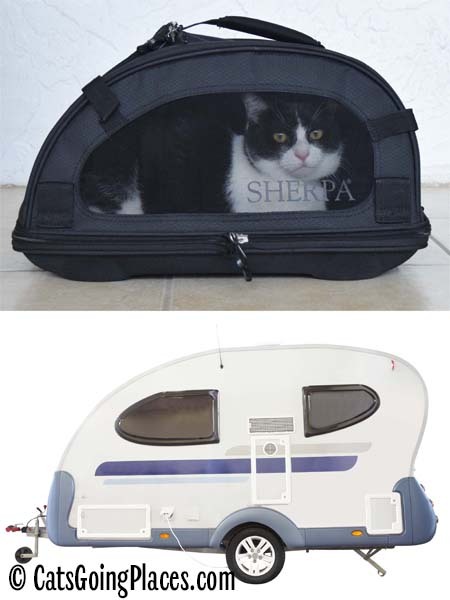 The first thing I couldn’t help but notice about about the Sherpa Comfort Ride pet carrier is its unusual shape. The carrier is rounded, and it interestingly not symmetrical at both ends. At first glance, it reminded of of a caravan camper you might see in a campground. I wasn’t sure what to make of this unique shape until it occurred to me that it can maximize the space under an an airplane seat where the flotation device underneath makes it impossible to fit a squared-off carrier with the same footprint. Because it is easier for a passenger to reach under the front edge of their seat, that is the portion of the under-eat space often occupied by life jackets. 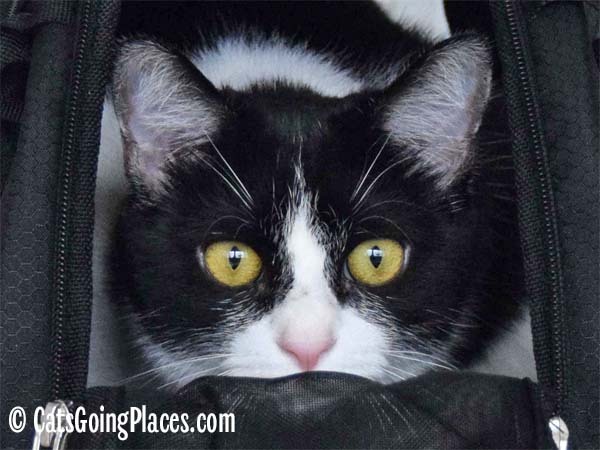 This means space under the seat where a cat must ride on a flight may get lower at one end. This carrier’s unusual shape allows for the possibility of such overhead obstructions in the storage area. 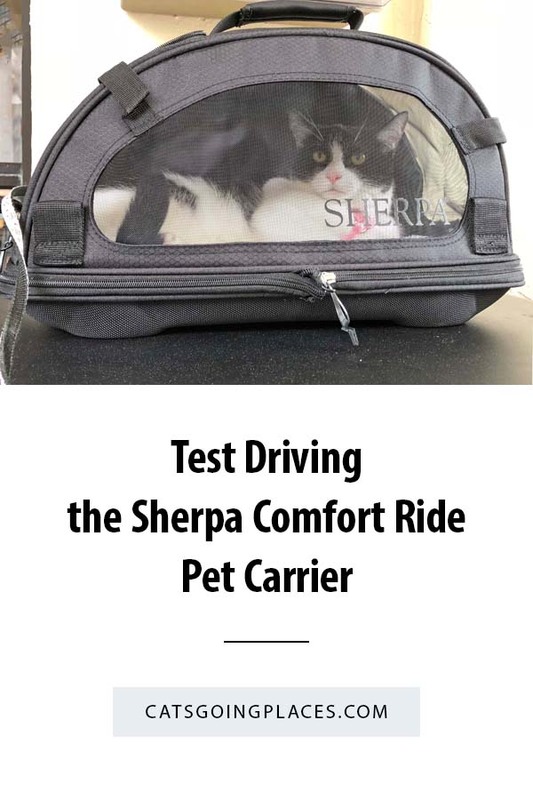 Speaking of the storage area the carrier occupies, the Sherpa Comfort Ride carrier is part of Sherpa’s Guaranteed On-Board program. 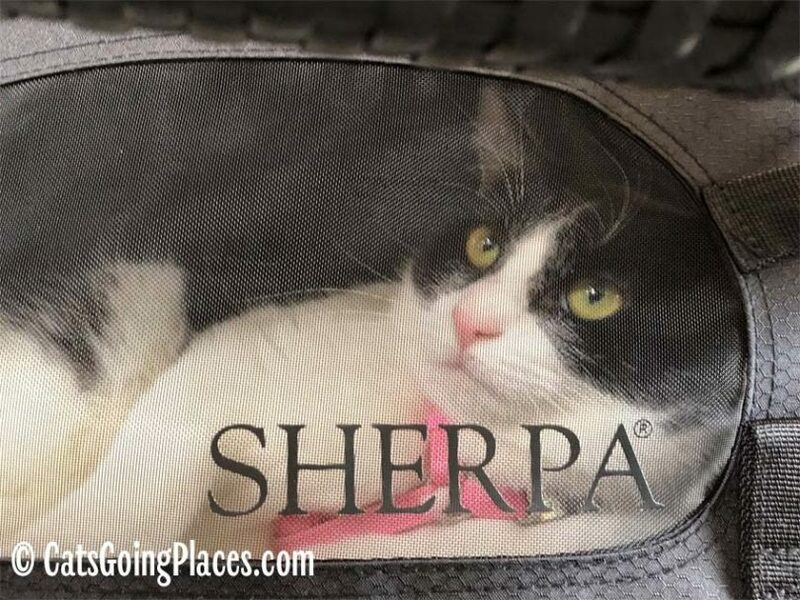 This program lets you look up your airline and see which Sherpa carriers will fit on board in the under-seat storage space. 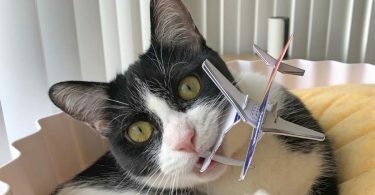 That was my biggest worry as someone new to flying with a cat. I was afraid that I would pick the wrong carrier and be turned away from the flight. With the Guaranteed On-Board program, Sherpa reimburses you if you are turned away from a flight when using the appropriately-sized carrier. That kind of peace of mind is priceless! Like all carriers intended to fit under an airplane seat, the headroom in the size medium Sherpa Comfort Ride is a little low, at 10.5″. It is also just under 18″ long. 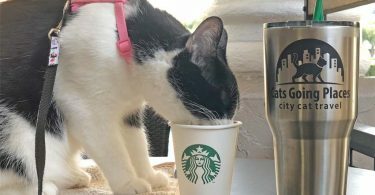 This isn’t a big deal to a petite cat like Cupcake, but a bigger cat might not find it comfortable. The build quality of the Comfort Ride Carrier is really good compared to other carriers in its price range. The fabric feels really sturdy, and the zippers and hardware are all durable and slide easily. Because of this durability, the carrier itself doesn’t have a lot of “squish” to it, so it seems like it would not be easy to slide the carrier under a too-low airplane seat, so pay attention to what the airline says about the space under the seats, just in case. Speaking of durability, the mesh on three sides of the carrier resists claw punctures and chewing. Cupcake didn’t try to chew on the carrier, but she was so comfortable inside that she did roll onto her side and knead the mesh window. I’m not sure what self-healing magic is in that mesh, but I couldn’t see any signs of holes in it afterward. 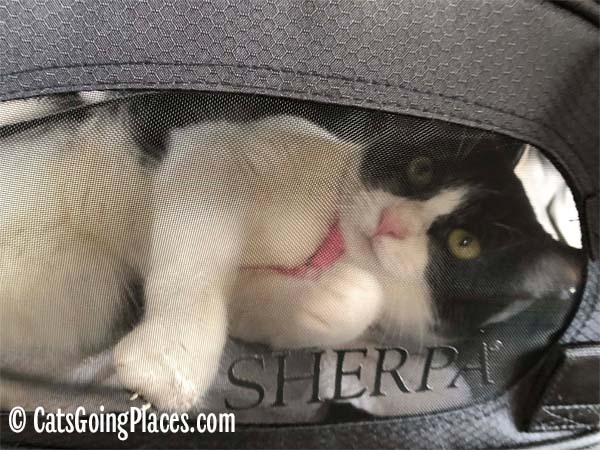 Cupcake kneads the mesh side of the Sherpa Comfort Ride carrier. 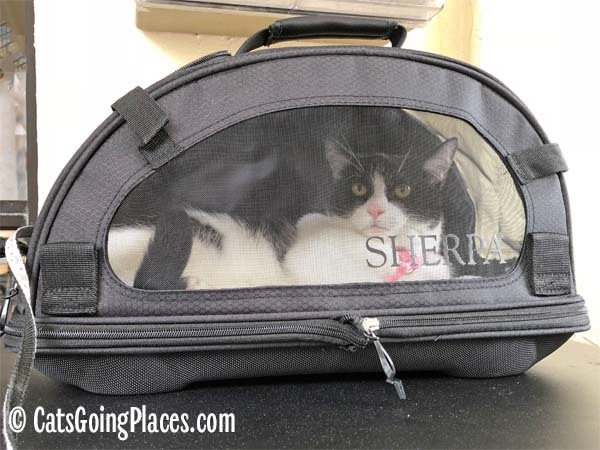 Three sides of the Sherpa Comfort Ride carrier are mesh, something that some airlines require. 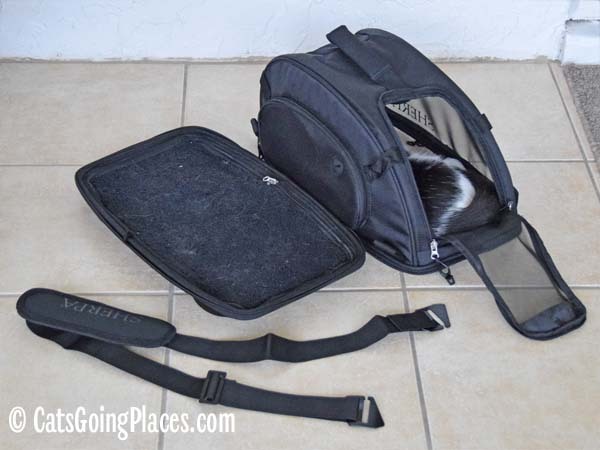 the unventilated side of the carrier has zip-closed pocket with two interior organizer pockets. The bottom of the carrier zips off for each cleaning or storage, and the removable shoulder strap has anchor points on all four corners, so you can personalize how you want to carry the carrier to accommodate right- and left-handed travelers. 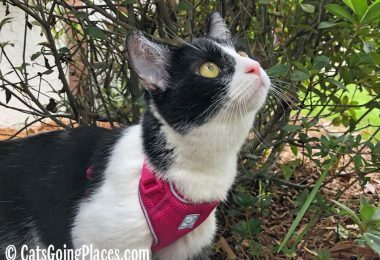 Cupcake enjoyed our outings with the carrier, and I was really impressed with its build quality and the self-healing mesh.  I wouldn’t hesitate to recommend it for small to medium cats who like to go places. We have the same carrier, and I love it! As you know, I’m a small cat, so it’s perfect for me. 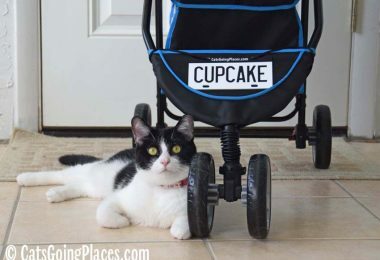 My human and I use it all the time for short trips. We haven’t used it on a plane yet, though.